For many years the general public has thankfully not had to give much thought to the threat of Chemical, Biological, Radiological and Nuclear (CBRN) attacks, treating them as worrying but unlikely events. This was sadly all changed by the Novichok nerve agent attack in Salisbury, UK in March of this year. This followed the use of the VX nerve agent in Malaysia against the half-brother of North Korea’s leader last year, as well as the repeated and documented use of chemical weapons in Syria over the past six years. In June this year the UK Government released its new counter-terrorism strategy, CONTEST. As the National Risk Assessment notes, terrorist attacks involving Chemical, Biological, Radiological and Nuclear (CBRN) materials are one of the highest impact risks to the UK, requiring additional planning and capabilities to respond to. CONTEST therefore committed to enhancing the UK’s capabilities to detect and disrupt terrorist activity involving CBRN materials, ensuring the UK has the resilience to effectively respond to these threats, and also ensuring that first responders from the emergency services and the military are themselves protected from contamination. While it may seem like the CBRN threat can only be dealt with by Government, industry actually delivers crucial CBRN defensive capabilities across the UK, at the border and internationally. 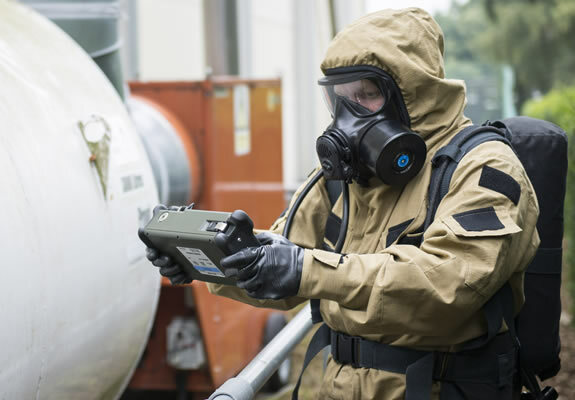 The UK’s CBRN defence industry provides a wide range of capabilities, including CBRN detection technologies, Personal Protective Equipment for first responders, hazard management systems, and medical counter measures. Thus, the private sector is already an active partner of Government, for instance working with the DEFRA to speedily return sites of an incident back to use and with the Home Office to deliver Programme Cyclamen, a programme that aims to deter, detect and intercept illicit radiological and nuclear imports. ADS is proud to have the special interest group CBRN-UK, the national supplier organisation representing UK industry’s CBRN capability to government, emergency responders, the military and Critical National Infrastructure operators. With over 60 members, CBRN-UK works to ensure that the UK’s CBRN industry can deliver the capabilities that the UK needs to reduce the likelihood of such an attack and, in the event of an attack, respond effectively and safely. On 20 to 21st November CBRN-UK will be hosting the 20th International CBRN Symposium at the new Farnborough International Exhibition and Conference Centre, and prior to that on 26th September CBRN-UK will be sponsoring a Biological Threats Masterclass at the Royal Artillery Barracks in Larkhill. In these ways and many others, ADS and the wider UK CBRN industry will continue to do its part to help protect the UK, alongside the emergency services and military.